(MissionNewswire) Salesian missionaries living and working in southern Chile are helping families affected by a chain of wildfires that killed at least 11 and destroyed thousands of homes. The fires, which spread quickly due to historically high temperatures and an ongoing drought, have burned 593,000 acres, about three times the size of New York City, according to a recent CNN article. France, Russia, the United States and Peru have sent international help to combat the fires. “We have never seen anything on this scale, never in the history of Chile,” said President Michelle Bachelet in the CNN article. She declared a state of emergency in late January. Salesian missionaries mobilized immediately to address the needs of affected youth and their families. Missionaries, along with volunteers, gathered donated items such as clothing, food and especially bottles of water for those affected and the firefighters battling the fires. With the support of the community, Salesian missionaries were able to collect basic supplies and deliver them to various reception centers where entire families who have lost everything are staying while needing shelter. 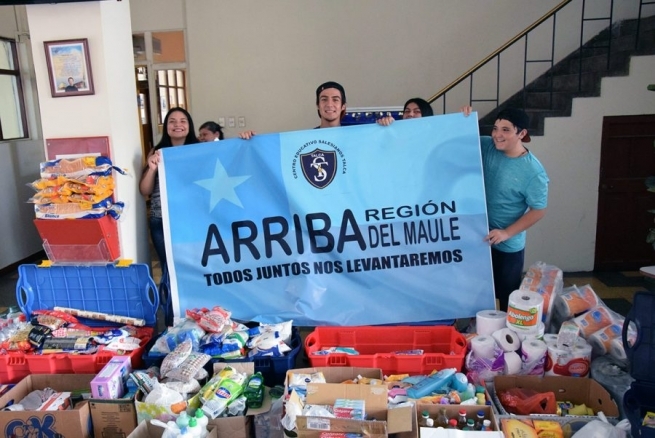 In addition, students from the Talca Salesian Educational Center, together with their families, brought aid to the people in the town of Curepto. To date, Salesian missionaries, students and volunteers have brought aid to the areas of Deuca and El Rincon de los Manzanos. Food was also sent to Constitución and the towns of Toconey, Carrizal and Pichamán. “It is impossible not to feel challenged by this, and as parents and guardians of a Catholic school, we are committed to help,” said Mauricio Espinoza, president of the Salesian General Center for Parents and Guardians. Espinoza also said that this experience has enriched the collaboration with other schools, firefighters, rescue workers and railway staff of Talca-Constitución. “It gave us the opportunity to serve, to bring help to the Curepto families,” added Espinoza. Salesian missionaries will continue to address the needs of youth and families affected by these fires. Distribution of aid will continue as needed and missionaries will work with families to address long-term needs in the local communities, as families and whole communities recover and rebuild from the fires. Salesian schools, social development services and workforce development programs throughout Chile are helping to break the cycle of poverty while giving many hope for a more positive and productive future. According to the World Bank, although the economy in Chile is one of the more stable and prosperous in Latin America, a little more than 5 percent of the population lives on just $2 a day. The country suffers from high economic inequality which is particularly evident in access to educational opportunities.